On this dreary Friday (at least in the Midwest! ), I thought I’d share some before and after photos to brighten your day. 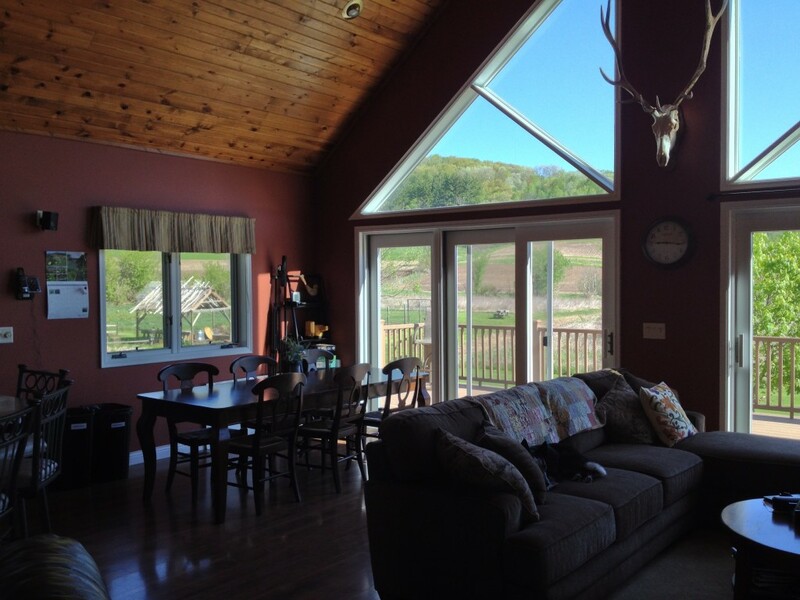 I was hired to help create some window treatments in a vacation home in rural Wisconsin. The homeowners live in the city, about 2 hours away, and use the home as a retreat. As you’ll see from the photos, privacy is not an issue. However, they wanted to be able to close up the house when they aren’t there. And, some sun control would be nice, too. 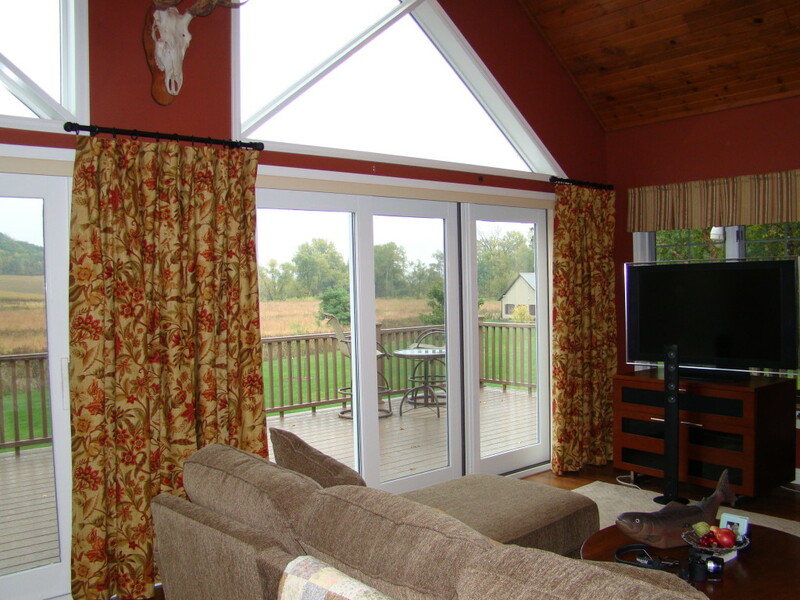 Most of all, she wanted to add some fabric to the windows to soften the “hunting lodge” look. 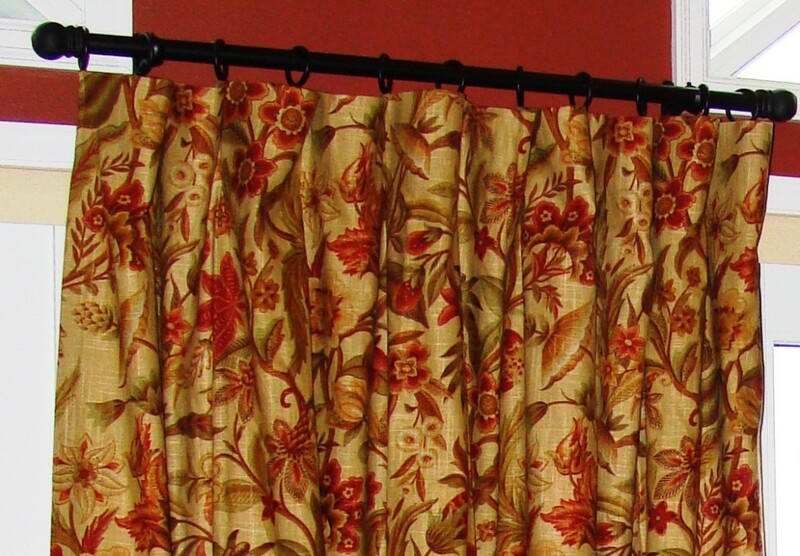 The fabric we selected also needed to work with the fabric valances she already had installed. So, we looked for an organic pattern that would complement the striped valances. She had no intention of covering the large triangular windows. She loves the light and they are not a problem for TV viewing, privacy or heat. 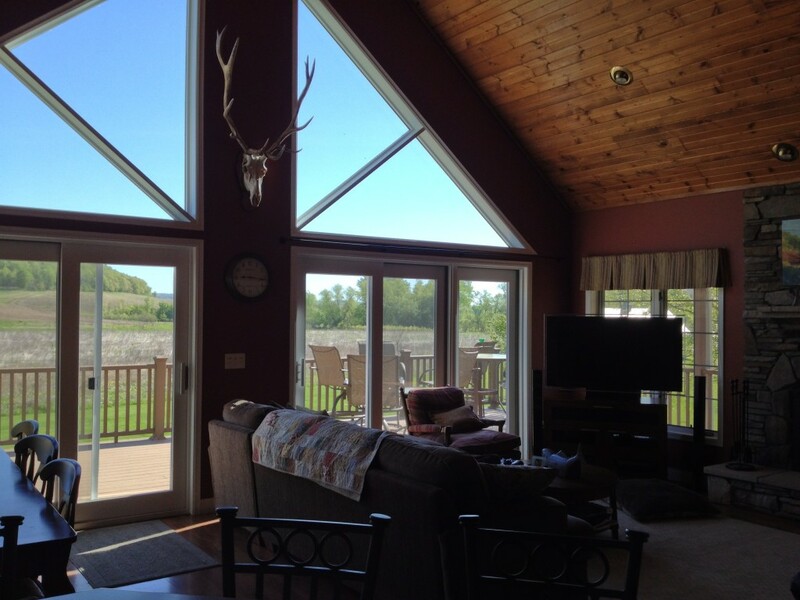 First, we selected Hunter Douglas Applause shades with Vertiglide. 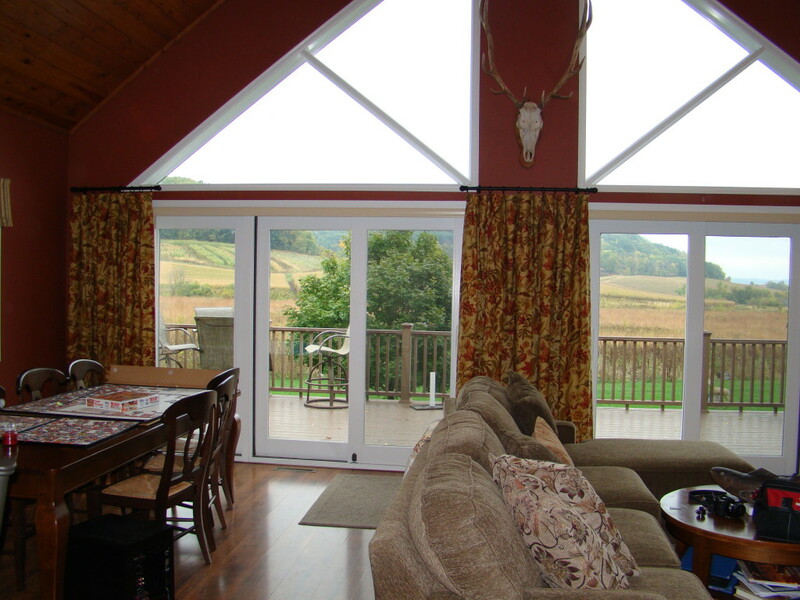 These honeycomb shades glide across the patio doors, stacking neatly to the side when they aren’t in use. We choose a light gold hue, which blends beautifully with the honeycomb shades that were installed years ago. In these “after” photos, the shades are almost completely hidden behind strategically-placed drapery panels. The only hint of their existence is the headrail across the top of each door. Sneaky, huh? To add a decorative element, we selected a fabric that accented the redwood color on the walls, while bringing in a bit of gold and green…earthy, warm colors…the colors of autumn in Wisconsin! We decided to use 3 short drapery rods instead of one long one. Why pay for all that extra rod, when the panels cannot move anyway? The black wrought iron rod with simple finials displays drapery panels made with a casual, draped heading. These aren’t a standard pinch-pleat drapery. The fabric drapes on it’s own, without much structure. The homeowner wanted a casual feel – nothing too formal or stuffy – and, I think we achieved that. She’s happy – which makes me happy!